A pair of running shoes and a dream can take you anywhere ! Tata Mumbai Full Marathon 2018 done and dusted in style. Packing my bags for the journey home….I fondly looked at my partners in crime….an old, unshapely looking pair of Adidas Glide Boost 6 and said to myself, ‘It’s time to let you go my old friend’. Strava had become rather insistent in telling me that their recommended mileage (300-500 miles) was long over….aaah well… emotional attachments aside, I reluctantly gave away the pair to my room attendant….the odometer on Strava finally read 1637 Miles… an epic journey through the thick and thin of sweat, pain, injury and great happiness on endless roads, beautiful trails, scenic vistas through rain, snow and sunshine ! ‘Oh, so you have decided to run a Marathon ? 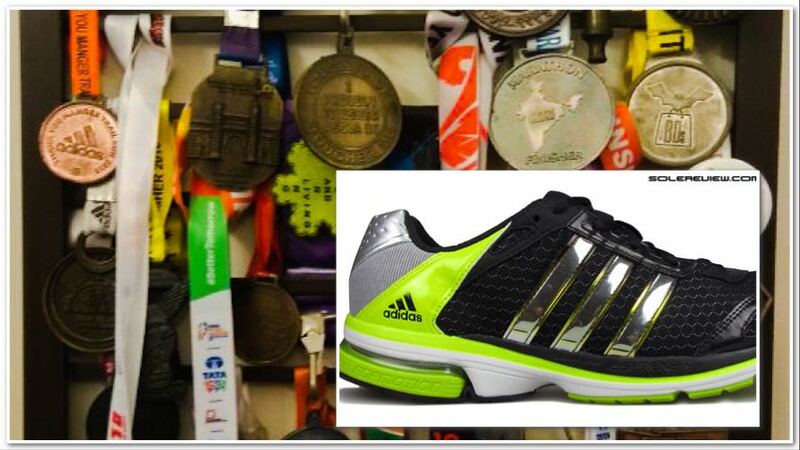 Get yourself a pair of good running shoes….and don’t scrounge on the cost…it will be worth it’…..lo and behold I ended up buying the then best on offer, a la Adidas Glide Boost 6, for the princely sum of Rs 11000 ! It was a sheer pleasure to run in them. Of course comments such as, ‘So much money for a pair of running shoes….he has gone bonkers…mid-life crisis!’ were part of the package ! Airtel 2014 was a journey of self discovery – from a deskbound honcho to a runner. The trio of Mumbai Marathons – each one a story of mind over matter…of realising that sheer willpower can make my body go much beyond it’s physical limits…and yes, I ran up the Peddar Road Hill every time…. a truly humbling experience each time. New Delhi Marathon 2017 – the most special. When I saw someone run the distance through 101 deg F high grade fever through sheer grit, steely willpower and iron determination. Respect ! Coming back to the point…..You ask….how come the same pair every time? Well….. we runners are a funny lot. I do endless research on the technical aspects of running shoes…type, pronation, cushioning, support, comfort, heel drop, response, bounce, performance under hot/cold/wet conditions and finally feel ! I also badger other runners endlessly on their experiences….and still, I sometimes buy purely on a whim and the feeling of the shoe. But we runners are an emotional lot too. Every race of mine has a story to tell. A story of difficult training sessions, the good times with my running buddies, the anticipation and build-up to the race, the pain, the effort and the joy of victory…or a list of lessons learnt ! My running gear and running shoes are an inseparable part of me and my running journey. I have my comfort zone of my lucky running shirt and my favourite running shoes….and that’s how I always chose my pair of Adidas Boost when it came to the crunch ! Adidas Glide Boost 6…you were good to me…we had some great times together…farewell my friend…I will miss you. The New Delhi Marathon 2018 beckons. I will be there at 0500h at the Jawaharlal Nehru Stadium…with my new friend…the Adidas Adizero Boston Boost…Happy Feet ! Gee Ess, a runner-thinker-blogger, constantly experiments with various running methods. Constantly improving and learning from his experience, he blogs his knowledge to helps his tribe by keeping them better informed and become better runners. Always looking for the next big high -physical, social, intellectual or spiritual, Gee Ess got hooked onto endurance running with ADHM 2014. A multitude of full and half marathons since then, he enjoys penning down the intriguing nuances of running that go beyond and hit the mind of a runner. Always looking for the next big high -physical, social, intellectual or spiritual, Gee Ess got hooked onto endurance running with ADHM 2014. Having run many full and half marathons, he enjoys penning down the intriguing nuances of running that go beyond and hit the mind of a runner.